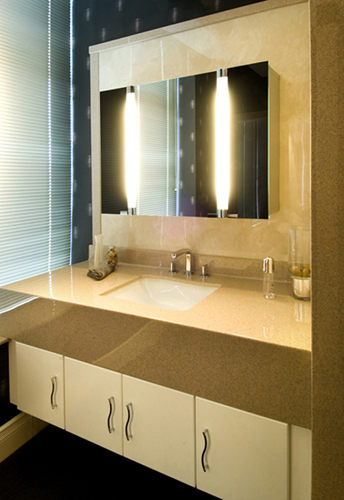 Bathroom Vanities are heavy used areas that have to look the part and withhold even the toughest wear. 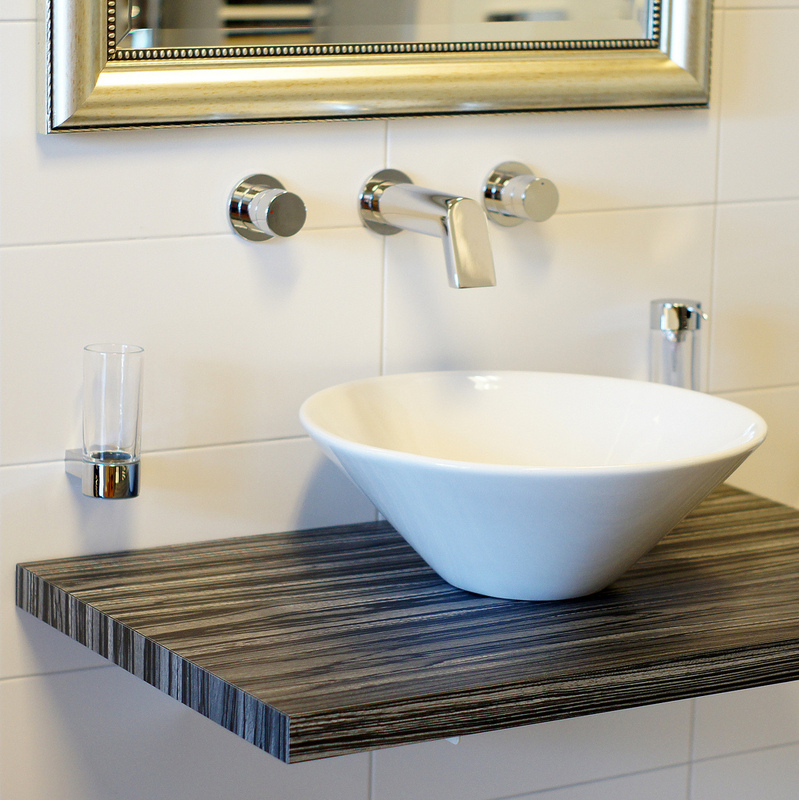 When creating your bathroom find a vanity top that not only looks great, but also performs well. Choose a material that will be easy to clean and maintain. That will guarantee the durability of your design and keep your bathroom looking amazing as time goes by. Size of the vanity top is an important consideration. Depending on the size of your bathroom you should select bathroom vanities that provide you with plenty of storage space, while leaving a lot of movement area. Consider doors and drawers either from cabinets or from the shower enclosure and ensure that the vanity does not get in the way. Give thought to existing features like electric sockets or your plumbing location. Many of those things can be adjusted, but considering them is a good starting point that can save you a lot of money. Depending on your requirements your bathroom vanities might require multiple sockets to charge toothbrushes or plug in hair dryers. 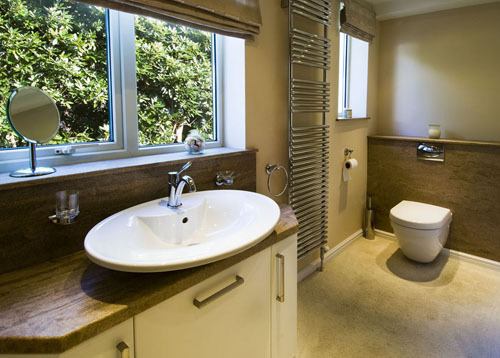 If you would like to discuss the requirements of your bathroom give a call to our team of experts, who are always happy to help. Placing a cabinet under your vanity top can provide you with considerable amount of storage space. Think about how much storage would you require to keep all your bathroom necessities and plan your Bathroom vanities with that in mind. That will allow you to think more practically and bring functionality to your design. Always plan for more than you need in order to have some comfort when you decide to add extra items. It’s a really good idea to find inspiration that will help guide you through the process. Look at inspiration pages online, browse through our galleries and blogs, read magazines or pay attention to hotel and restaurant rest rooms, they can provide you with a lot of ideas that you can adapt for your home. Knowing the style that you are looking for will make it much easier to select from the vast range of choices, saving you time and money. If you would prefer to speak with someone about your possibilities contact us and our team of experts will provide all the assistance you need. 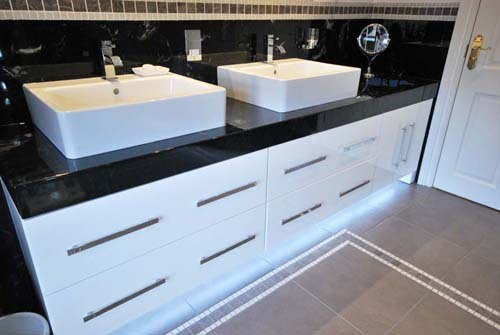 Bathroom vanities can be produced with a vast range of materials. Wood, tiles, quartz, glass, marble, stone resin are just a couple of popular choices, each of them has their pluses and minuses allowing you to choose the one that suits you most. Wood has a natural beauty, that allows you to choose from a variety of different colours and finishes and can create a sustainable, modern ambience. However, wood is also a naturally porous material meaning that it will absorb water. In a heavy usage area like vanity top wood can quickly discolour or damage due not only to water, but also other chemicals like soap, toothpaste or shaving cream. To prevent that from happening wood needs to be very regularly maintained and even then, the result is not guaranteed. Using tiles to create vanity tops is a traditional solution. 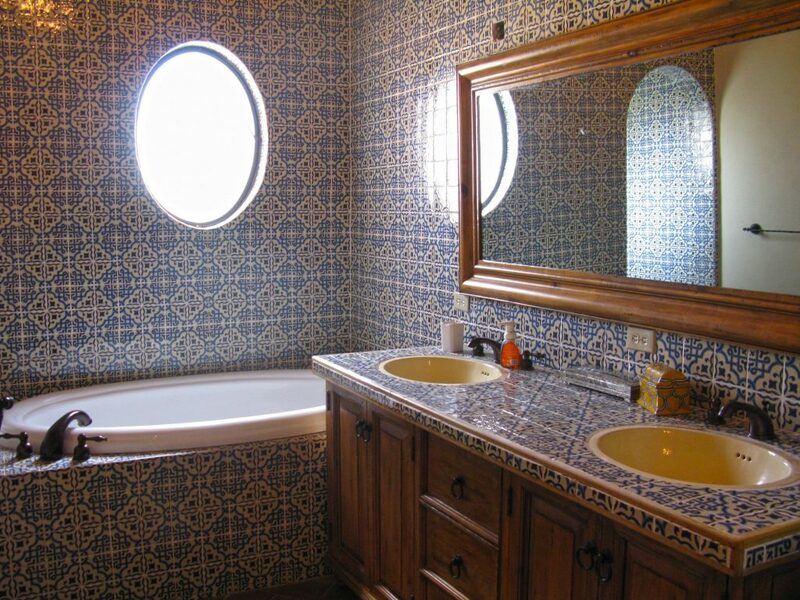 If you use tiles on the wall you can continue the same pattern on your vanity top and create a unified look. The one main negative point about tiles is the necessary grouting. Unlike tiles grouting is a porous material, which like wood allows for the absorption of water, leading to growth of unappealing and unhealthy mould and possible breakage and cracking after time. Consider replacing areas that have high water exposure with a less porous surface like Versital vanity tops to prevent future problems, and use tiles to add an interesting design feature in less water-exposed areas. 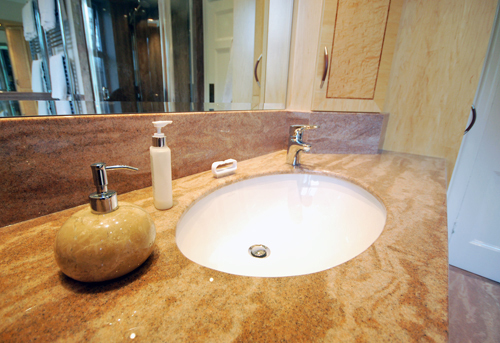 Quartz vanity tops are usually made up from natural quartz combined with resin to create a finished product. 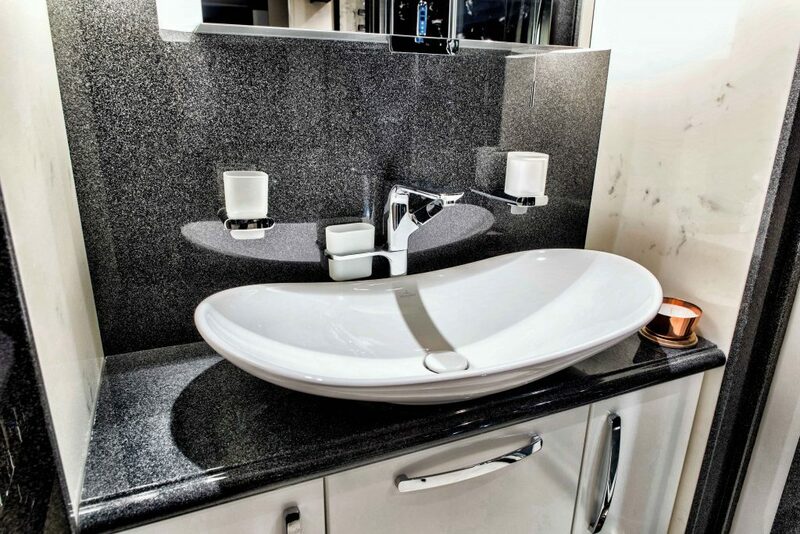 Vanity tops created with quartz are very hard wearing and unlike many other options are fully non-porous and do not require sealing. 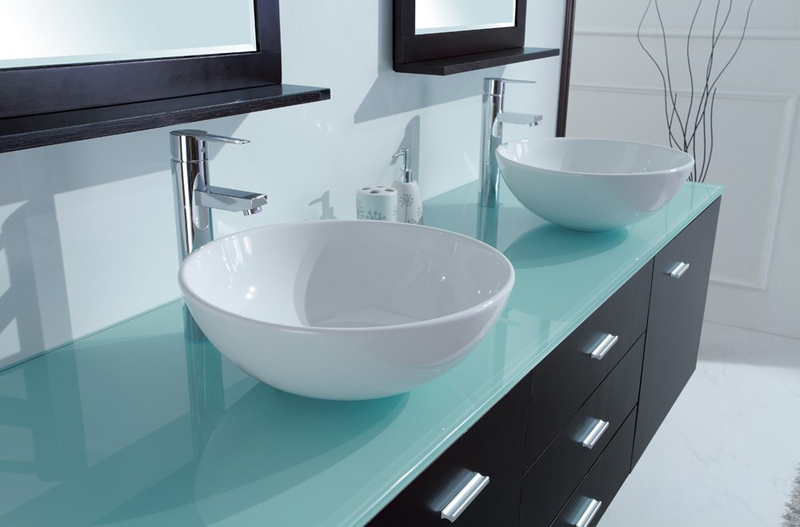 Quartz also comes in a variety of colours allowing you to choose your perfect style. The main drawback of quartz is the ease with which it chips or breaks. You need a skilled fitter to install it without problems, you should also opt for round edges to prevent it from getting damaged over time. To get all the benefits of quartz including the pattern and the natural look without the chippings consider Versital vanity tops. Contact our team of experts to discuss your options. Using glass can help you really make a statement. Glass has very similar properties to quartz. It is fully non-porous preventing any stains. One of the main issues with glass is how visible the soap marks and hand prints are. Glass is also brittle, meaning that it can easily chip or break if anything heavy gets dropped on in. 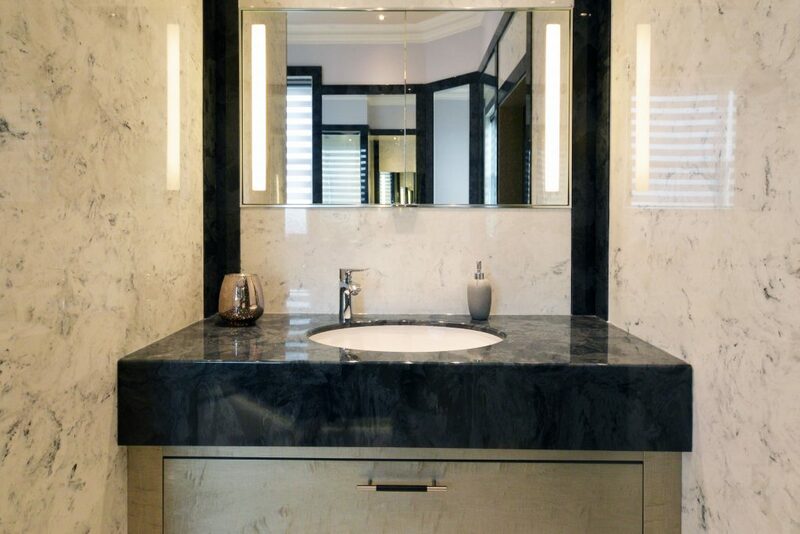 A true classic, marble vanity tops can look really beautiful in your bathroom. The most sought after marbles such as Carrara shown below, can be an expensive option, but create a luxurious feel and really add opulence. There are a range of marble colours available. It is worth keeping in mind that marble from soured from different quarries will differ in colour and pattern and therefore pieces to be used together should be sourced and purchased at the same time from the same place. 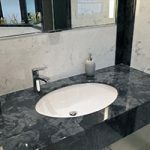 Due to its naturally porous properties marble will very likely stain with use and similarly to granite has to be sealed. 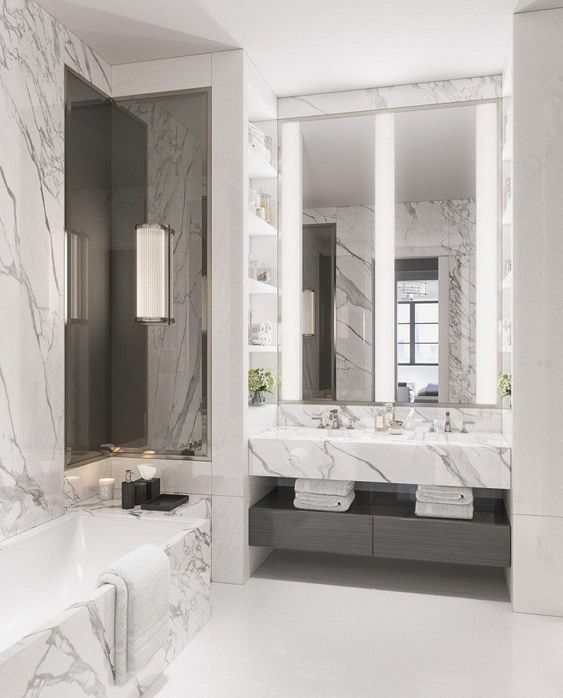 Versital offers a major benefit over real marble, offering a true to life marble look that is total waterproof and stain proof making it ideal for use in bathrooms, and especially high traffic areas such as vanity tops and showers. It also offers consistency of colour over different batches, allowing additions to be purchased over time. Stone resin is a cost effective and more practical replacement of both marble and granite. Due to its almost unlimited colour palette solid stone resin found its way to be one of the most popular choices for bathroom vanity tops. Versital offers a range of over 100 colours in its range allowing you for true freedom of design. 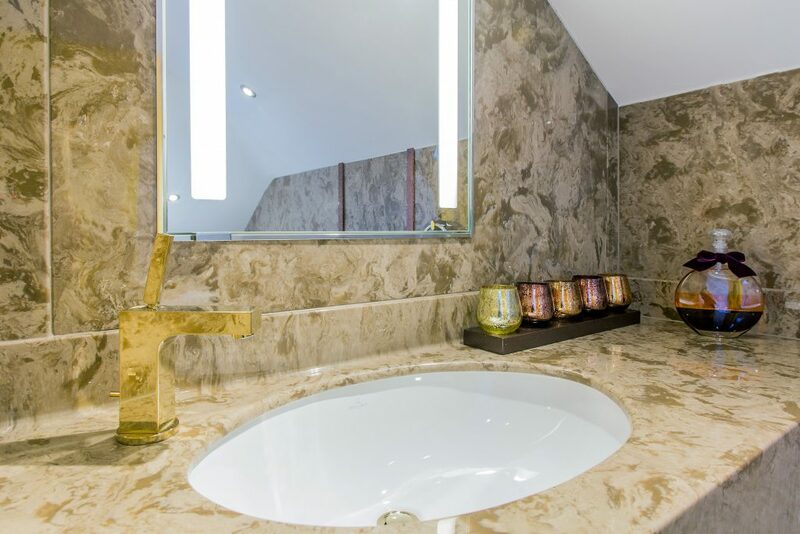 Cultured marble or granite produced by Versital is not only true to life, but is also covered with a protective gel coat ensuring the fully non-porous surface protecting you from problems like mould or water damage. Redesigning your bathroom every year to change the damaged vanity top can be a real costly endeavour. We recommend selecting a product that will be durable and allow you to reap its benefits over a period of time. 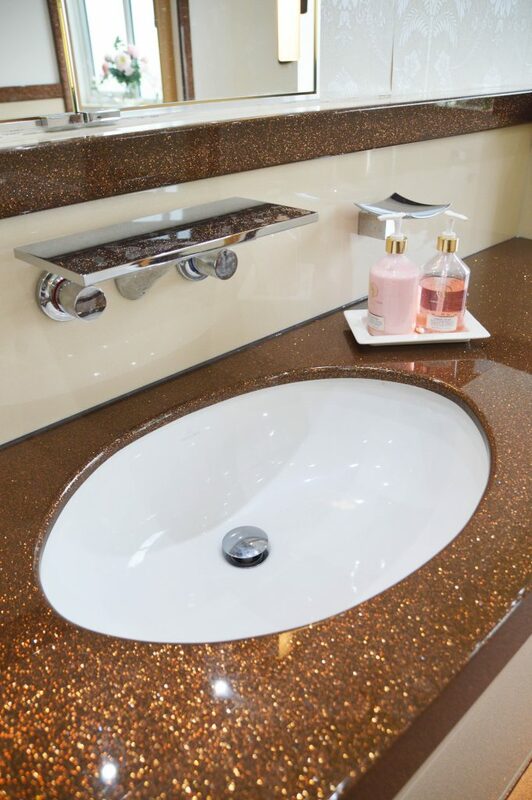 Do not compromise on the look by using the Versital vanity tops. They offer true to life options, with marble and granite finishes, and for people with a taste for more modern and contemporary décor the new range of metallic marbles has recently been introduced. Versital is hard wearing and due to its non-porous surface prevents problems like mould, stains or water marks. It is ideal in high usage and really wet areas like vanity tops due to the above properties. Versital is also very easy to maintain as a wipe with a wet cloth can make it look as good as new. For more information on our range of bathroom products, take a look at our full range. If you would like advice, samples or wish to place an order for a vanity tops, shower panels or shower trays, please call us on 01204 380780, or email us at sales@versital.co.uk.